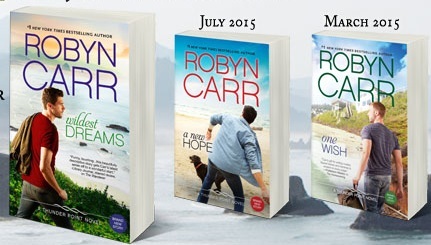 #1 New York Times bestselling author Robyn Carr didn’t always plan to become a writer. She was originally trained as a nurse, but because her husband (and high school sweetheart) was a pilot in the Air Force, her young family was constantly being transferred and it was difficult to find work in nursing. As they moved around, Carr spent a lot of time reading genre fiction and thought, “I can write this.” She got her first book deal in 1978. Thirty-eight years—and more than forty published books—later, Carr’s bestselling Virgin River series has more than 2 million books in print, and nearly every book in her Thunder Point series debuted at the coveted #1 spot on the New York Times bestseller list. 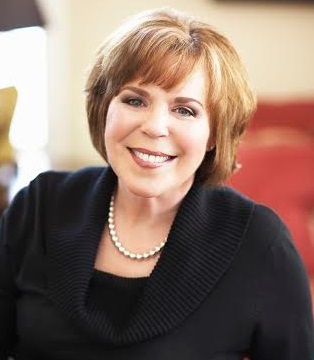 In addition to writing, Carr has mentored a seniors’ memoir-writing group, attends book-club chats in and out of her home state whenever possible and works with her local library in Nevada on a literary chat series. Carr’s new book, What We Find, and is being published on April 5, 2106. I’m a storyteller, that’s what I do best. I was fortunate to be born with insatiable curiosity and a fertile imagination. I don’t think you can learn it or earn it, I think it’s a little like perfect pitch – you either know where the notes are or you don’t. Then it’s a matter of what you do with it, how hard you’re willing to work, whether or not you can improve your style. I’ve seen writers with great natural talent squander it just as I’ve seen writers with a little bit of talent do great things with it. That’s where it all becomes personal. I don’t think of myself as the best. I’m more inclined to reach for my personal best, and that’s all about the novel that comes out of me. It has to be revealing, entertaining, stimulating and satisfying to the reader. When I finish a book and can’t stand the idea of stopping, that’s when I feel I’ve reached my personal best. Then I have to let go of that story and move on to the next. When readers write to me and tell me that they’ve been through a trauma or crisis like a character I’ve written and that I got it right, that they identified, I’m a success. When they write and say reading my books got them through a dark or painful time, I’m a success. When they tell me I’m their favorite author, I’m a success. There’s no single strategy for becoming a successful author – it’s entirely up to the readers. No matter how much promotion we do at the end of the day it comes down to word of mouth. If readers love it – they talk about it. Personal: I want to continue to reach a little deeper into the emotions of the characters, bringing them closer to the readers. There are so many things people have been through that they really don’t want to dwell on or talk about, but they do want to relate to the story in a safe place. They want to visit those emotions connected with the business of living, with the complexity of relationship. They want to experience characters as role models and watch them solve human problems in a safe, intelligent, meaningful way. My goal is to do that better each time. Business: The business of writing is to earn a living – that’s hard enough. Most writers, I’d say 95% of writers, can’t support themselves with their craft. Every year the Author’s Guild releases the results of a survey showing the average income for writers and it is achingly low, like under $5,000. Any writer who can support herself with her writing is a huge success. Beyond that, it is my business aspiration to do a good job, be on time and be kind and encouraging to others who are trying to make this writing thing work. For a writer one of the most challenging situations is when you and the editor disagree on an important part of the novel. But this is a great learning situation. A good writer learns compromise and negotiation; a good writer learns to focus on the book without ego, making sure the story emerges as powerfully as possible. Listening is key, letting go of preconceived notions and the flexibility to try something new if only to see how it fits. Patience and flexibility -- two things I'm usually running a little short on, are required. It can be a maddening process -- we writers can get very married to our ideas and our image of certain characters. Another huge challenge for me is reading reviews. I'm very fortunate, they are 99% great. But then that one mean and ugly review comes along and it gnaws at me for way too long. “It will be all right in the end and if it isn’t yet all right, it is not yet the end.” --The Best Exotic Marigold Hotel. I am drawn to and admire strong and thoughtful women – women like Eleanor Roosevelt, Nora Ephron, Michelle Obama, and Alice Walker. I’m very attached to my computer and my circular brush. While I prefer to hold a printed book to read, I’m very fond of my e-reader – it travels so well. And Google! I’m looking things up all day long. Here are my priorities – my family and my work. I don’t care very much how well a certain book sells (although it is good job security if books sell well!) but I love to fall into a story and forget everything else. The only people who can safely interrupt me are my granddaughters.